Experts in custom web design, brand strategy, ecommerce, and analytics. We increase your online business with targeted razor-sharp design, rich user-friendly technology, and a singular focus on your customer; all in an optimized, mobile-friendly package. We have a history of successful creative direction, web design and development that sells our customers' products. We know our stuff. We should - we have been doing business since 1999. Our ecommerce partners provide the highest quality systems with high-value, high-volume online shopping solutions and support to set up every department of your virtual store and increase your online sales. It is a whole new world of technology that requires expertise to convey your message. We understand what is involved in responsive design and development and work with you to identify basic mobile requirements that fit your business goals. Good design is more than a striking look. The key to our approach is to create a custom website that your customers will find easy to use across all of their web-enabled devices. Our work is brand-conscious, product-centric and strategic with emphasis on usability, smart human factors, and cool graphic design. Is your message fragmented? We will work with you to develop content that elevates and organizes your online marketing with a clear and compelling message. We will help you decide on the most effective solution to support your long-term business goals; from creative direction and brand strategy to art, design, and technology choices. Need help once your project is over? We provide design and technology maintenance services for your website and graphics. We also provide training on site-management applications and social media to customers who want to have a greater hand in the care and feeding of their website and online marketing. Get ahead of your competitors - we will help you understand how Search Engine Optimization (SEO) works. We will create a search-friendly foundation and help you to actively manage your results position with both short- and long-term strategies. Opening your business to Social Media opportunities is the best targeted marketing you can employ. We will help you understand which arena is right for your business goals and bridge the gap between technology and getting your message out there. By choosing values-fit partnerships, we help our clients grow and flourish, and we grow and flourish in turn. We have been fortunate to work with great companies who come to us only by referral. We value professionalism, experience, talent and skill and take great pride in the quality of our work. 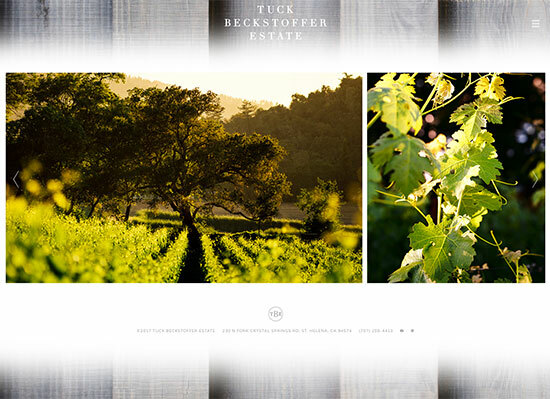 We created a responsive website with a modern look-and-feel for Tuck and Boo Beckstoffer to showcase their unique wine brands and highlight their sense of place in the Napa Valley. The wine industry has unique needs, and it is a pleasure to create successful projects for our wine clients. We have wonderful relationships with wineries in Napa Valley and Sonoma, California as well as wineries in Oregon, Washington, Italy, and France. 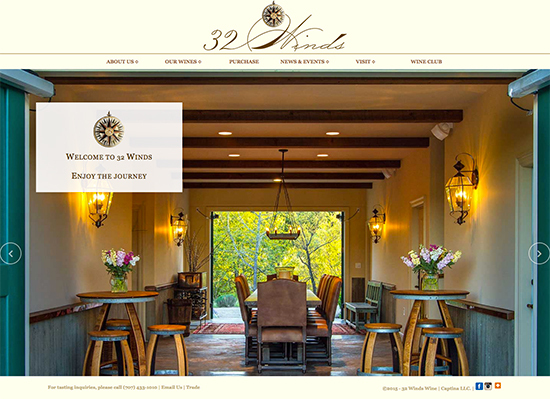 We combined the unique brand imagery of 32 Winds with gorgeous photos and designed a responsive website integrated into Wordpress. We worked closely with Alder Springs to capture their distinct landscape and the personalities of each wine. The website is visually luscious and ties in seamlessly with their Nexternal ecommerce system. 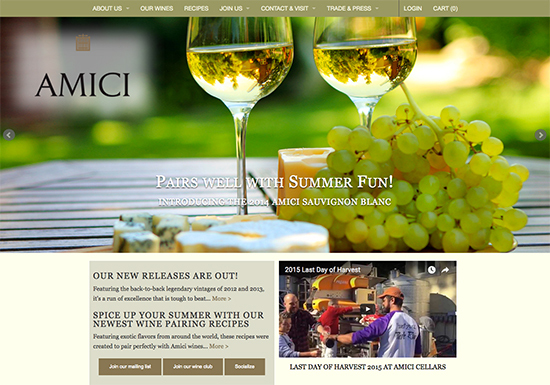 We created a responsive website with a sophisticated look-and-feel for Amici Cellars that highlights their unique brand strategies and offerings and tied this in with their VineSpring ecommerce system. 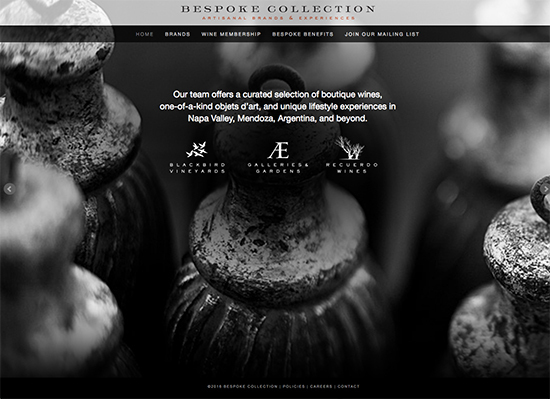 Our long-term relationship and experience with each brand in the Bespoke Collection gave us the opportunity to showcase their unique personalities while giving careful consideration to the company's identity as a whole. We created resonsive websites with unifying Bespoke design hooks and individual brand style. Since 1999, the Blackbird Vineyard quietly provided fruit to many of Napa's finest winemakers for whom it yielded astonishing comments from Napa Valley veterans and noteworthy editorialists. 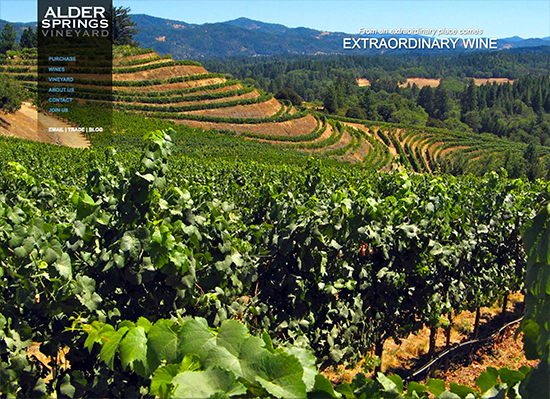 Purchased by Michael Polenske in 2003, Blackbird Vineyards is now an ultra premium label in its own right. Part of the Bespoke Collection. Æena Galleries & Gardens show the work of emerging, mid-career and established artists, offering a great range and selection of styles and media. 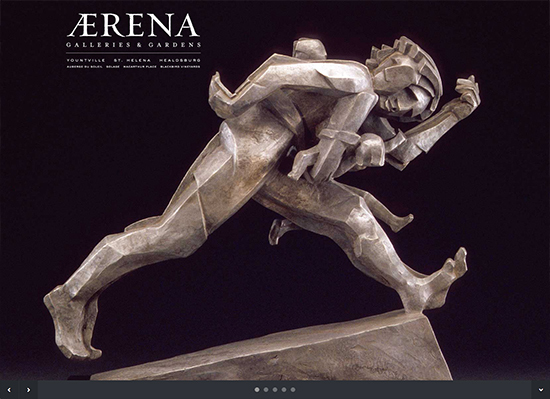 We created a modern, high-style website that highlights Æena's unique brand and fantastic artists. Offering enthusiasts the opportunity to experience exceptional premium wines that capture the best of Argentina's unique terroir, specifically within the high-altitude Uco Valley. 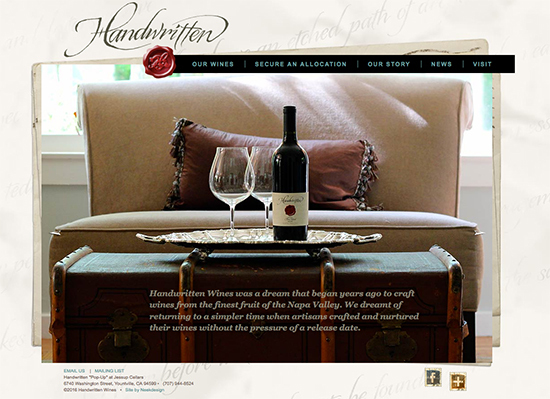 We created an interactive website that highlights the personality and quality of the brand - the website conveys a personal experience like that of receiving an elegant and special handwritten letter. We also carried this feeling through to their online newsletter marketing campaigns. Herb Lamb Vineyards nurtures a cool-climate hillside property that consistently produces some of the finest wines in the Napa Valley. 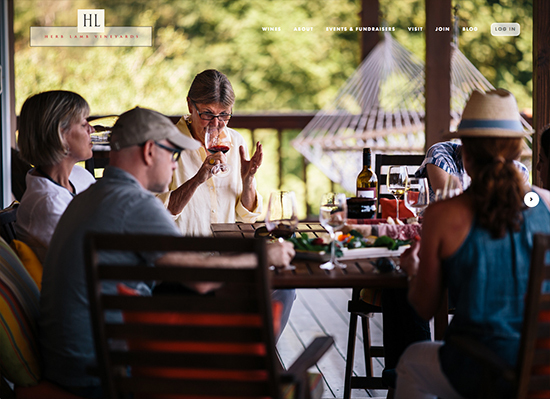 We created a highly visual, responsive website that showcases the personality and quality of the land and wines. 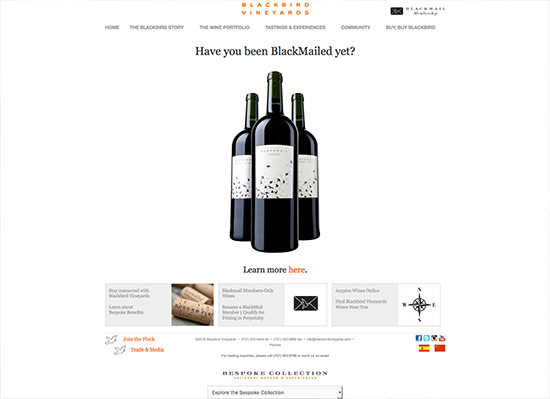 We also carried this through into the winery's marketing campaigns and Nexternal ecommerce system. It has been our pleasure to work with the Lewis Cellars team for many years. 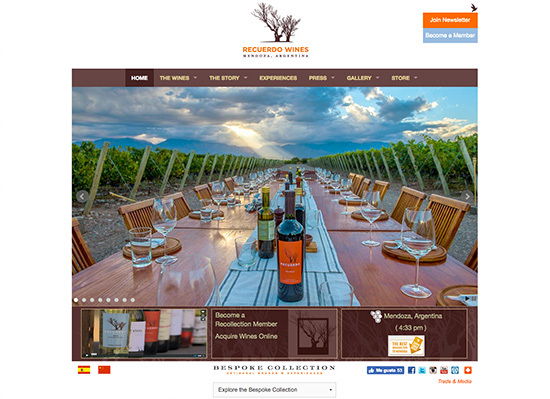 We were delighted to take their branding to the next level by designing and building a responsive website to showcase the winery and the hard work that goes in to every wonderful bottle. 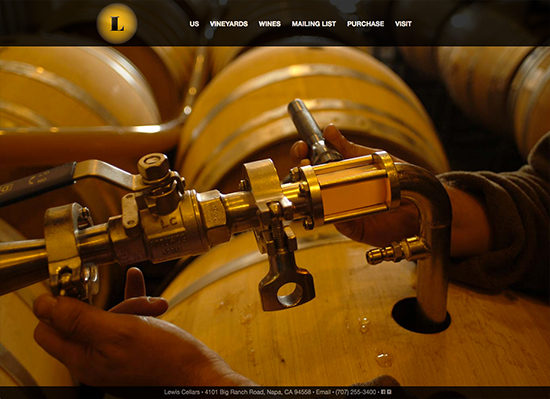 The website conveys the unique style that is Lewis Cellars and integrates seamlessly with their Nexternal ecommerce system and mobile-friendly store. 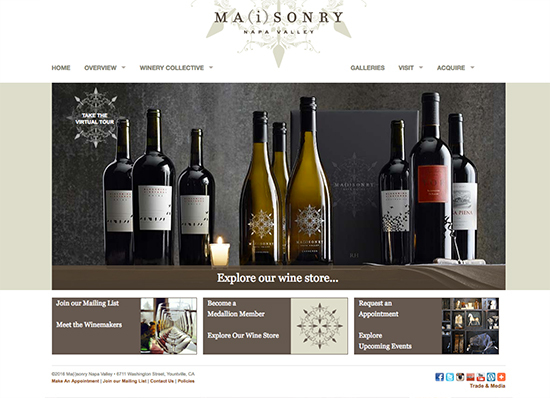 The Ma(i)sonry lifestyle brand offers a unique experience in wine country. Originally built in 1904 as a private residence, the manor is one of three stone buildings in Yountville, and one of only two listed on the National Register of Historic Places. It has been our pleasure to work with Ma(i)sonry since its inception and help to create a beautiful and lasting brand. Producing stellar California wines with a French flair since 1992. 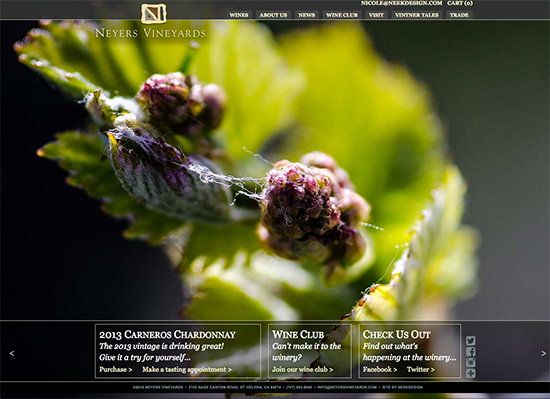 Neyers' home vineyards are located in the hills east of St. Helena, and we wanted to highlight this gorgeous location. We created a modern, sophisticated website that shows the personality and quality of the brand, carrying this through into their online newsletter marketing campaigns and Nexternal ecommerce system. It is a joy to showcase the hard work of our clients by creating beautiful and functional frameworks. We work on projects for individuals and companies in a variety of industries and market spaces. 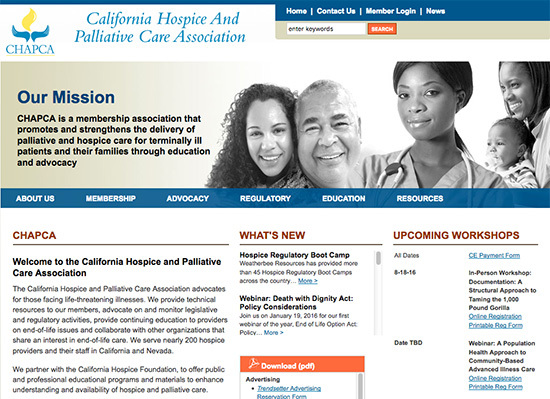 CHAPCA advocates for those facing life-threatening illnesses. We created a brand strategy and website for the organization that presents their mission clearly with a sophisticated look-and-feel. 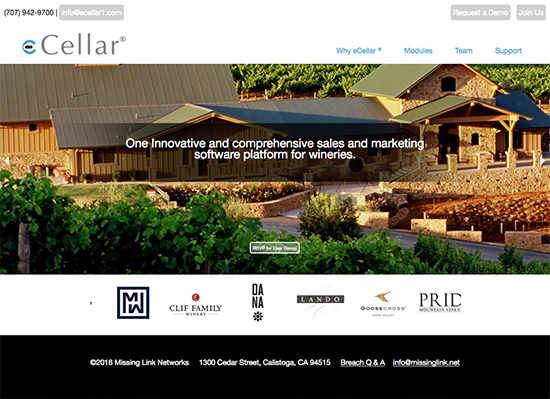 The eCellar web-based, single vendor sales and marketing software solution works for wineries of all sizes. The Point of Sale (POS) module displays across all channels in one central view and allows quick find/search of existing customers and orders. We created a company logo and new brand identities for eCellar and its suite of modules as well as an elegant, responsive website and application interface that highlights the company's product-and-service offerings. 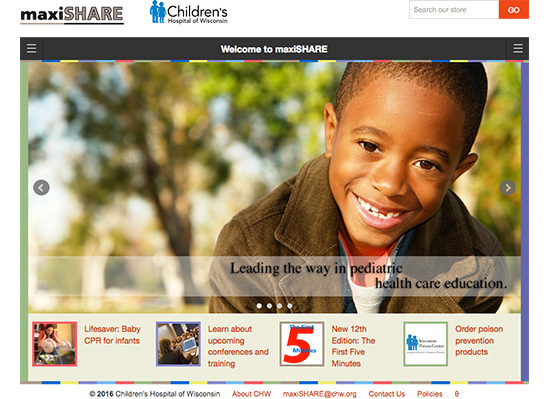 maxiSHARE is the leading provider of pediatric educational materials, helping pediatric patients, caregivers, teachers, and health care professionals since 1983. We created a resonsive website that integrates with their Nexternal ecommerce system. 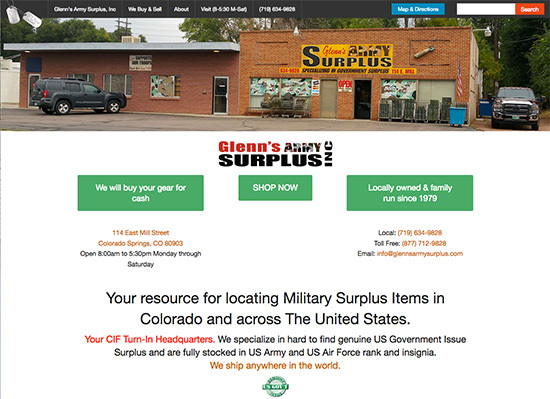 Glenn's is a true, old fashioned army surplus store, locally owned and family run since 1979. They specialize in hard to find genuine US Government Issue Surplus and are fully stocked in US Army and US Air Force rank and insignia. We created a responsive website to work seamlessly with their Nexternal ecommerce system. MJ specializes in coaching high performance executives, entrepreneurs, and leadership teams around the world. 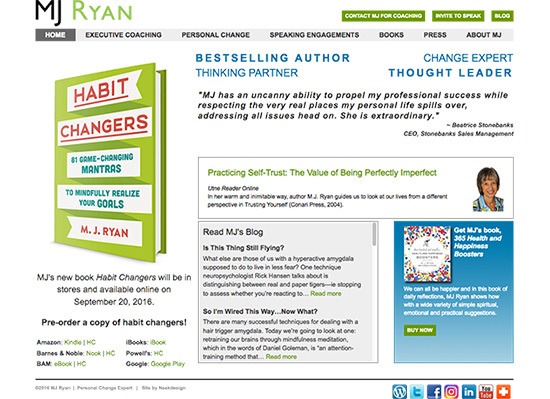 We created a sophisticated brand strategy, logo, website, and blog that engage new clients, invite speaking engagements, and promote MJ's bestselling books. 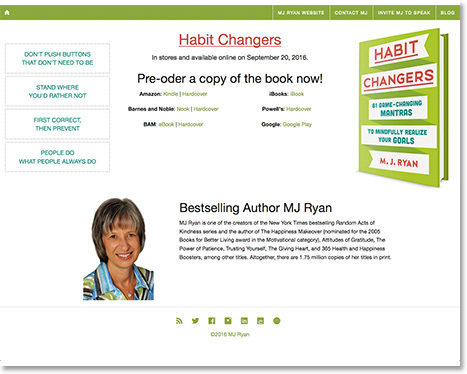 We created a responsive website to showcase MJ's most recent publication. 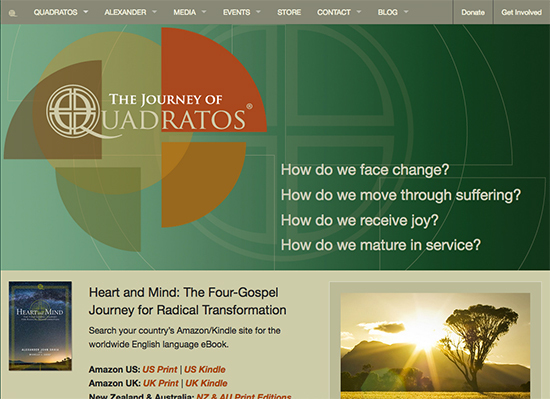 We developed a brand strategy, logo, blog, and website for the Quadratos® community, utilizing social media to inform with the latest news, downloadable libraries, and search functionality. 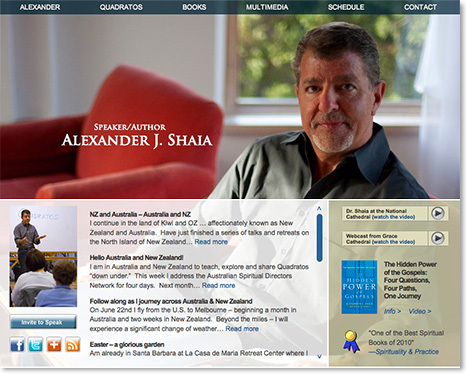 We also integrated Cart66 into the Quadratos website and created a unique Wordpress author website and blog for Dr. Shaia. Interested in working with neek•design? Please fill out the form below to help us get a sense of your business goals and project requirements. Uncertain of all the details? That's all right. Give us as much information as you can, and we will give you a call to discuss your project further. Collaboration and co-creation is at the core of everything we do. Our clients' success is our success, and vice versa. Our clients are focussed on running and building their businesses and turn to us, the experts, to make their websites look and behave in a way that compliments their core branding and messaging. Designing a website is much more work than people realize, and it can get complicated quickly. Templates can work for bare-bones organizations that just need a website to function as a business card, without complex functionality, but professional companies should pursue custom website design. We design and build custom websites, considering SEO best practices and learning what kind of ROI you are looking for. When you work with neek•design, you are getting Creative Direction at the highest level. We champion the intersection where Art, Design, and Technical Acumen meet Strategy by ensuring that all elements and approaches support our client’s bottom line. We intend for our partnerships to be co-creative around our shared ambitions and focus on how we can build something great together. Art, Design, and Technology should work hand-in-hand to deliver your point emotionally and physically. Art Direction is about evoking the right emotion that connects what you are seeing with what you are experiencing. By contrast, Design is the Technical execution of that connection. The best Creative Directors are jacks-of-all-trades and masters-of-all-trades. We think about all of the possible scenarios and help our clients to make well-informed decisions amongst tough choices. Then, we deliver. Whether HTML or Wordpress, we are going to create a custom design for your business. The Neekdesign website is our custom design built in a responsive, up-to-date code base. This is our preferred development method, because it allows us to create websites that align with our core values; websites that are professional, uniquely branded to our clients, credible, search engine friendly, responsive, flexible, adaptable, and scalable. Many of our clients have need of content management. In the rare case where our clients have multiple contributors and want to do all their own maintenance with a bare minimum of HTML, our CMS recommendation is Wordpress with a custom Neekdesign theme. For our full-scale custom websites, we provide maintenance training as part of our web package.